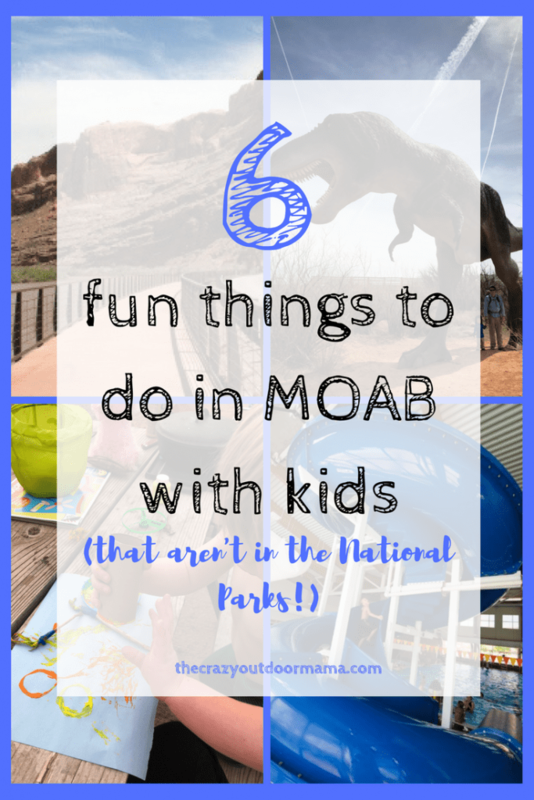 There are actually tons of activities to do with kids in Moab, though it’s often overshadowed by the two amazing national parks nearby! When we planned our trip, we planned for big hiking days (Here’s my list of the hikes that were are fun and easy with the kids in tow in Arches National Park!) that we knew would mess up nap schedules, wear out our toddler, and frankly wear us out trying to get so much done! We also planned for days right after the big ones of just hanging out around camp, and doing fun things in town that were a little less intense. That way, we could plan the smaller activities around naps, and give everyone a day to recover before embarking on another big adventure! Though it was hard not to make it work and just go to Arches and Canyonlands every day, we were pleasantly surprised at the amount of fun kid stuff there is to do in Moab. It has a cute little downtown area, and there are lots of places just out of town to explore and adventure in! The River Road Paved Trail is a super easy, scenic bike ride that starts only a mile out of town. It runs along the Colorado River, and has some wildlife viewing areas so be on the watch! Bighorn sheep were introduced into the park a while ago and can sometimes be seen on the cliffs! This bike path is completely paved and has a lot of options in terms of distance and direction. It is 6-8 miles depending on how far you go, but obviously, you can turn around whenever you want! There is hardly any elevation gain so this is perfect for little legs! Park at the Lion’s Park Trailhub (only a mile from town so you don’t have to go too far!) and start your journey from there! 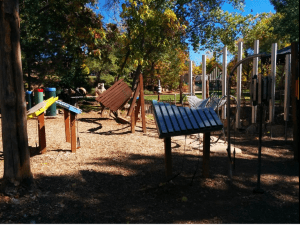 There are three parks in Moab, but I’m going to talk about the Rotary Park! It has a stream, tons of shade, picnic areas and of course awesome stuff for kids to play on. There is also a giant assortment of mega instruments to play and use! With all the open area and pathways here as well, Rotary Park is the place to go have a picnic or just do something different than hike! At the bottom of this page is a list of the rest of the parks in Moab as well as some other cool kid activities! Pick up some new, cheap hiking gear for the kids at the second hand store! I don’t know about you, but I LOVE thrift shopping and generally any way to save money. I actually even wrote an article on how to save TONS of money through Amazon; I am a fan of good prices! When I saw Moab Gear Trader I had to go in and see how good the prices were! I didn’t really have any good hiking pants, so I was set on finding some quality stuff in here. I ended up finding some Mountain Hardware hiking shorts and some Colombia Hiking Pants for SUPER cheap! I noticed there were a lot of cheap name brands, as well as stuff for all seasons. There was even a kid section! If you forgot to bring anything for your outdoor vacation in Moab, I highly suggest going to Moab Gear Trader! Everyone inside is very helpful, and they are kid friendly! P.S. 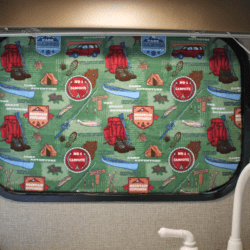 Here’s a list of some of the must-have gear for camping and hiking with kids here! Take a swim in the pool! 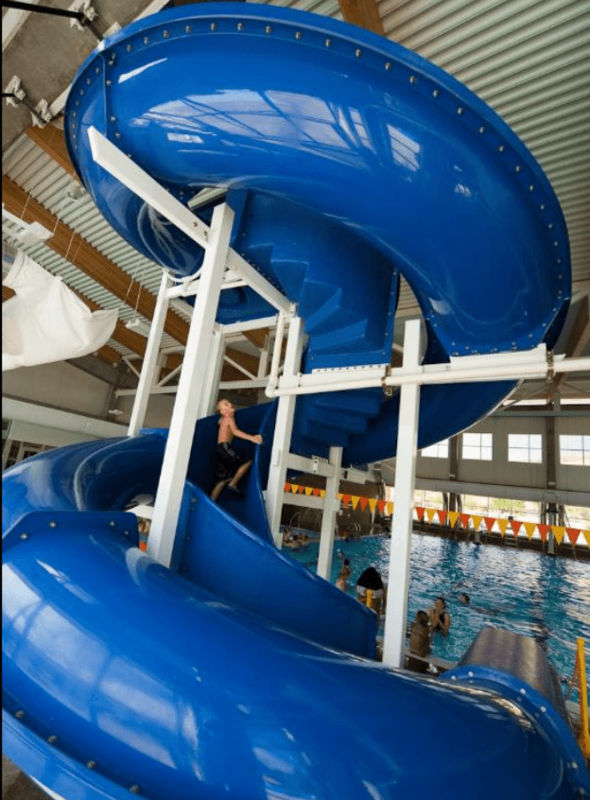 The recreation center in Moab has an awesome aquatic center the kids will love! There is an indoor section with a slide and diving board, as well as a lap area for the bigger kids. The outdoor section of the Moab Rec Center has a shallow area for the little kiddos, a small lazy river as well as another lap pool. It’s fairly cheap (I read online that a family of 6 got in for $25.00) and is a great way to break up your vacation or beat the heat! 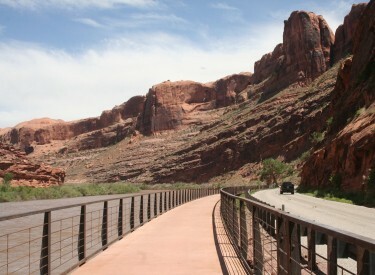 See the dinosaurs of Moab with the kids! I myself am a GIANT dinosaur fan, so going to Moab was pretty exciting just for that reason! If you don’t know, Moab is home to tons of fossils and petroglyphs available for the public to see. It’s also home to a wonderful Dinosaur Park called Moab Giants. It has a half mile trails with over 100 dinosaurs to see, plus fun photo ops and fossil digs along the way! The kids will love the giant sandbox like areas with excavating trails, and being able to touch some of the dinosaurs! Moab Giants also has a super cool dino themed playground, a 5D prehistoric aquarium, theater, and cafe! 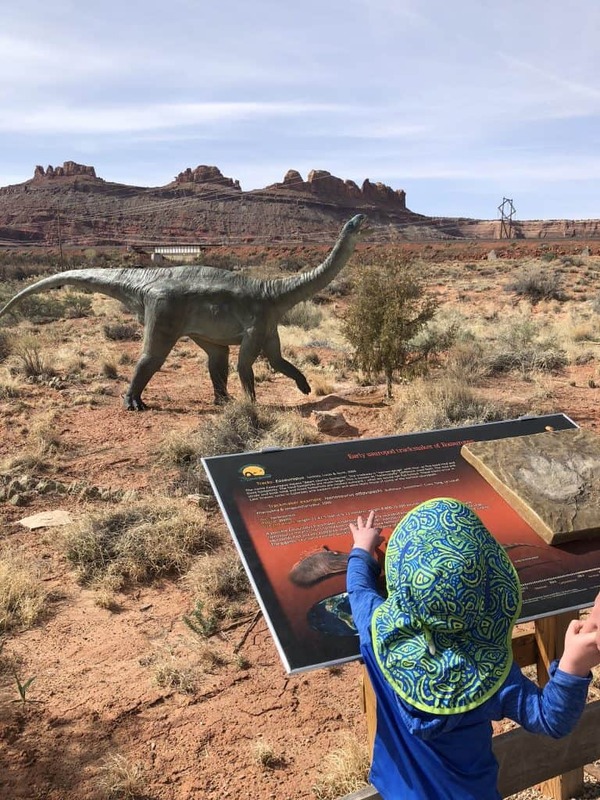 It was super fun for my toddler as well as the rest of the family, and a great way to get a taste of all the dino happenings in Moab! 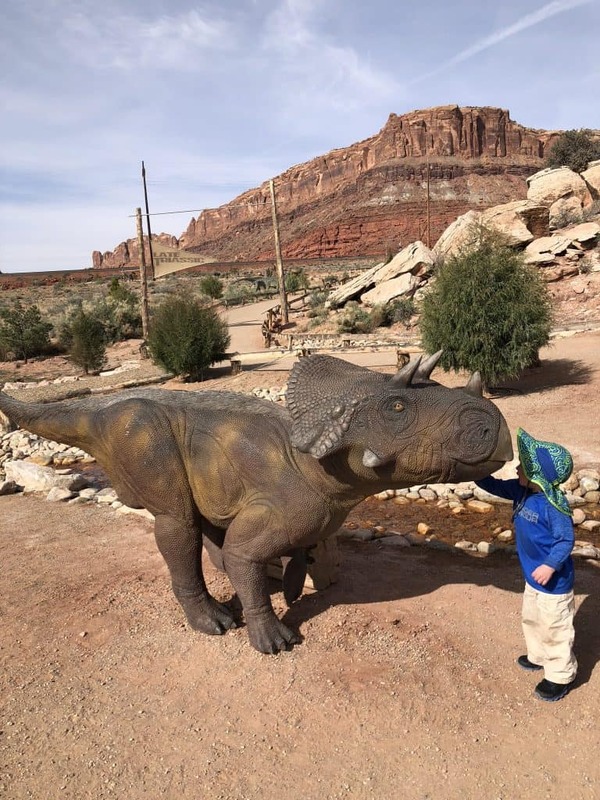 My toddler getting to meet the dinosaurs in Moab! Have a craft and reading day around camp! 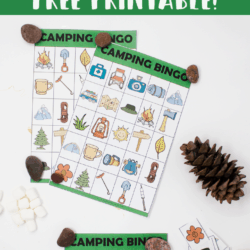 I absolutely love crafts, and have a “Camping Craft Pack” (Read about that here!) in the camper at all times for when things are a little slow. I’m also sure to bring some books along when we camp, and our trip to Moab was no exception. I love books having to do with whatever activity we’re doing to help get my toddler excited about it! 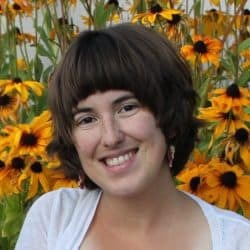 There are a ton of great camping and hiking books that are toddler level that talk about all the positives of getting outside, as well as how to deal with some negatives (new sounds, bad weather etc). Check out the list of my favorites here! 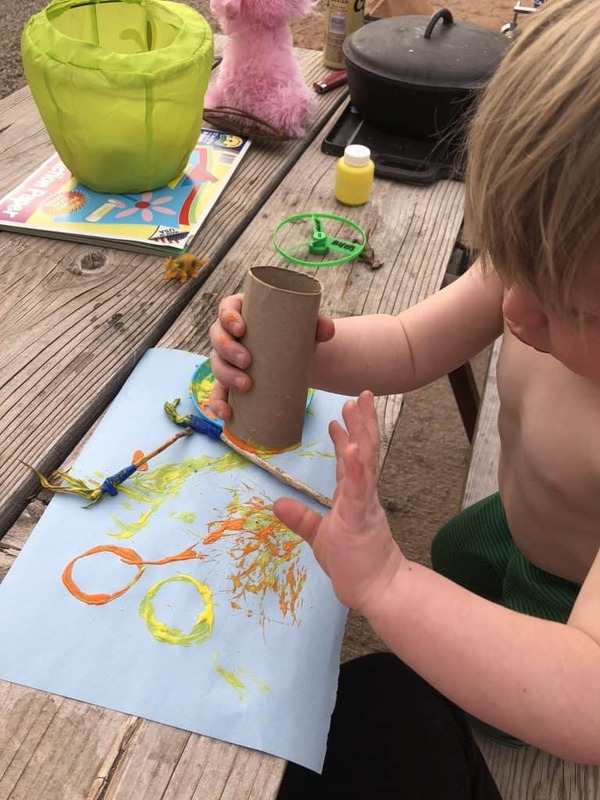 Having fun with a little paint and some items we found around camp! Did I miss a fun activity to do with kids in Moab? Let me know! We all know that Arches and Canyonlands National Parks are awesome, but sometimes we need a relaxing day to recharge for the next adventure! Especially when it comes to hiking with kids in such an amazing place as Moab!